The Lake District is renowned for stunning scenery, majestic mountains and, above all, lakes. Speciality coffee? Less so. However, if you know where to look, there are some gems to be found, such as Homeground Coffee + Kitchen in Windermere. Since opening in May 2015, Rich & Jane have made Homeground the go-to destination for coffee lovers (and those who like a good brunch). Carvetii’s seasonal blend is the mainstay on espresso, where it’s joined by either Carvetii’s own second espresso, or a guest roaster. There’s also batch-brew filter, with one of Carvetii’s single-origins or another guest. During my visits, Homeground was between guest espressos, with local roasters Red Bank due on, while the batch-brew was Carvetii’s naturally-processed El Salvador from Finca Nazareth. If coffee’s not your thing, there’s tea, single-origin Kokoa Collection hot chocolate and a limited selection of wine/beer, the latter from the local Hawkshead brewery. When it comes to food, Homeground Coffee + Kitchen more than lives up to the name, with an all-day brunch menu available until three o’clock in the afternoon on weekdays (four o’clock at weekends). There are the usual staples of various things on toast, plus pancakes, waffles, soup and a burger. Homeground Coffee + Kitchen is easy to find. On the southern edge of Windermere’s compact town centre, it’s on your left as you drive in from Bowness, just at the start of the one-way system. Alternatively, if you’re coming from Kendal/Keswick, it’s just on the way out of town. Either way, you’ll need to find somewhere to park, although you can avoid that by coming by public transport, Homeground being a few minutes’ walk from Windermere train station. There are also plenty of buses. Homeground occupies a simple spot, a floor-to-ceiling window running the full width of the café, save for the door on the left. In warm weather, the window can be slid across to the right, connecting the café with the tables outside on the pavement. Inside, Homeground is split into two, with seating at the front, and the counter, plus a smaller seating area, at the back, beyond which is the kitchen, visible through a serving hatch in the back wall. The bulk of the seating is at the front, starting with a window-bar running the window’s full width, lined with six high, low-backed wooden chairs. A padded bench runs along the left-hand wall from door to counter, complete with four two-person tables, while the right-hand wall, a gorgeous stone and slate affair, has a pair of four-person tables followed by a two-person table at the back. Right in the centre is a long, ten-person communal table. The rear half of Homeground is almost as large as the front, but the lower ceiling, combined with a slightly raised floor (there’s a small step up), make it feel much smaller. The counter’s on the left, espresso machine facing front, while there’s more seating on the right. A pair of sofas face each other across a coffee table, with a wood-burning stove on the right-hand wall. Behind the far sofa is a two-person table and, beyond that, another bar lines the back wall, sharing space with the kitchen serving hatch and a water station. Although there are two chairs back here, it’s very much seating of last resort. To order, you need to head up to the back of Homeground and along the length of the counter to the till at the back, which takes you past the cakes as you go. The drinks menu is conveniently chalked up on a massive blackboard behind the counter. Alternatively, grab a seat, peruse one of the menus on the tables (food on the front, drinks on the back) and then make your way up to the counter order. 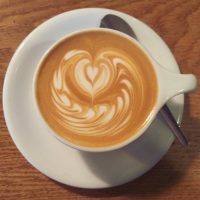 I visited twice for breakfast, starting both my days with a lovely, smooth, fruity flat white made with Carvetii’s seasonal blend, a mix of Ethiopian and Nicaraguan beans, the milk and coffee in perfect harmony. On my first visit, I selected the sourdough toast and poached eggs, to which I added flat field mushrooms. This all arrived on a single plate, each element individually presented, which I appreciated. I can sometimes find sourdough a bit hit and miss, but this was excellent, crunchy at the edges and soft in the middle. Meanwhile the eggs were perfectly poached, with firm whites and runny yolks. Last, but not least, the mushrooms were thick and bursting with flavour. It was so good, I was back the following day for Huevos Rancheros, essentially a pan full of baked beans and baked eggs, served with more excellent sour-dough toast on the side, along with a mashed avocado. The beans in particular were filling on a rainy, windy autumn morning, while the eggs were once again done to perfection. This entry was posted in Breakfast, Cafes, Cake, Lunch, Windermere and tagged include by Brian Williams. Bookmark the permalink.